Find Roland F 120 Review below. Roland F-120is a SuperNATURAL Piano in a modern Cabinet. F-120 is stylish and an ideal choice for piano enthusiasts who are looking for authentic sound and touch in a space-saving, a contemporary cabinet, and at an affordable price. Roland F120 makes use of the Roland’s acclaimed SuperNATURAL Piano engine, providing the ultimate piano sound and response. Its minimalist aesthetic design will blend into any home interior. Roland F-120 is a piano that fulfills many wishes in piano players. It comes with many features found in higher models at an affordable price. F120 brings a new level of authentic sound and natural performance with its SuperNATURAL Piano engine. It aids in analyzing the complex and ever-changing characteristics of concert grand pianos. It captures and reproduces the tonal variations based on the velocity of each keystroke. With Supernatural, 3 key elements are noticeably enhanced: note decay, velocity response, and key-range behavior. Roland F-120 digital piano is a slim, stylish, compact piano. It can fit anywhere within your room. It comes with a unique folding-lid design which covers the keyboard. It also serves as a music rest when it is raised. The keyboard is fitted with an Ivory Feel-G keyboard which features Progressive Hammer Action. The F120 gives you an expression and performance that rivals that of high end pianos by combining the newest sensor technologies and Super NATURAL Piano sound engine. 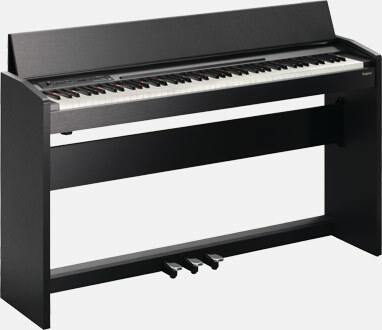 F120 Roland piano is more than a great, it is equipped with amazing features that will enhance your skills. For instance, Twin-Piano is designed for you to have side-by-side lessons or performances with a duet partner or a teacher. The twin piano feature enables the keyboard to be split into two sections, each covering the same octaves. You can easily hear what the teacher is hearing teaching and replicate the practice. Also the left and right pedals can be reassigned to act as damper pedals for either side of the split keyboard. It also has a built-in metronome and recorder.